It’s 10:00 PM. Do you know where your children are? Some of you may be too young to remember this public service announcement from evening television programing during the 60s and 70s. For some reason, I was reminded of it when I sat down to write a blog post about seed storage. Does your seed storage system help you fulfill your goals for your seed? Does it manifest intention more than neglect? When spring time comes, do you know where your seeds are? Seeds of most vegetable varieties that we plant in our gardens are fairly resilient. We gardeners sometimes take advantage of this. Do the seeds you have stored at home all rest comfortably in airtight containers, arranged tidily on shelves in an environment where temperature and humidity are tightly controlled? Mine do not. Part of my job at Heritage Farm is to facilitate a highly organized system of seed storage in rooms and chambers with precisely controlled temperature and humidity climates. This may seem like something of a paradox or inconsistency. Why is one way appropriate for home and the other for work? I mean, seeds are seeds, right? My “system” of seed storage at home may not look very elegant. Except for the wire rack on which the box sits, it does not in any way resemble the Preservation Collection seed storage areas at Heritage Farm. There’s one box, and it’s stuffed pretty full with seeds in paper envelopes and sandwich bags. While it may not be pretty, the home system is functional because of its location in the consistently cool and dry environment of my basement. 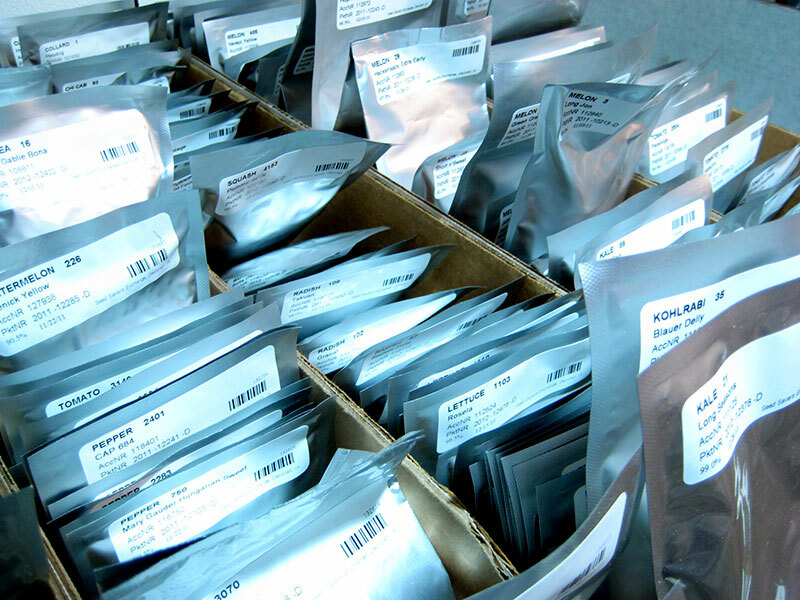 Heat-sealed foil packets for long-term seed storage at Seed Savers Exchange. The Heritage Farm long-term storage systems and protocols are necessary for the work of Seed Savers Exchange: to preserve and distribute the seeds of thousands of heritage garden plant varieties. In order to best preserve a given variety, we prefer to grow it as infrequently as possible. The longer the seed can remain viable in the freezer (and I’m talking decades longer here), the less often the variety is exposed to the environmental and other pressures which accompany a grow-out. These pressures may cause subtle changes to its identity. The dry and very cold conditions in our freezer vaults and chambers help ensure that the seed samples we distribute through the Yearbook and Online Exchange will have a high germination rate, even if the lot from which the sample is taken is years or even decades old. How do you store your seeds? Let us know! I hope to see a variety of systems in your responses, because I expect that we all have different goals and reasons for storing seed. Send me an image with a few sentences of description, or even just a description. Maybe tell me how your system works well for you, in what ways it might work better, and whether or not you have any plans for its expansion or improvement. Be honest – no tidying up before you take the photo! Address the email to preservation@seedsavers.org and write "my seed storage" in the subject line. *Edit as of 08/01/2014: Thank you for all of your submissions! We are no longer collecting images for the conference but encourage you to comment with any questions you may have about storage. For some helpful tips on home seed storage, view this past webinar or check out this blog post.